Pens Lose: Not a Finga! Well, 3-2 on the road is as Crosby would say, something to build off of. Then again, 4-5 in the month isn't really anything to be excited about. At the same time, last nights game against the Canucks didn't say very much for either team in my opinion. This was the final game on the 5 game road trip for the Pens, and both Fleury and Johnson unavailable to mind the net. Having called up John Curry from WBS proved Curry is just that, an AHL goalie. Clearly this was the difference maker. And after going down 6-1, the Pens didn't seem to show very much interest in coming back. Rather than recap let's evaluate my keys to the game from the pregame and see how the Pens measured up. SCORE EARLY: This we did. Geno finally tallied one up in the goal column while crashing the net. You could tell this wasn't the way he wanted it, but hey, a goals a goal. Though this didn't amount to anything in the final analysis. GOALTENDING: Fellow PU contributor Oz pointed out [here] that Curry's numbers were atrocious. I don't blame him as much as the Pens defense, they left him out to dry. 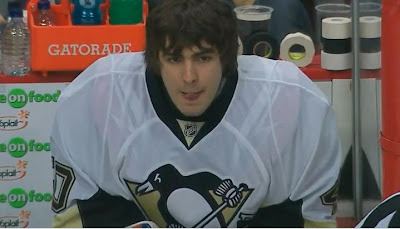 He's not Fleury, he can't make saves like that. The defense really needed to step up and did not. On another note the 19 year old Alexander Pechurski proved he could be a solid goaltender in the years to come. Stopping 12 of 13 shots was enough to get him the third star honors. SUPERMAN (Crosby): Sid was a -3 with 0 shots on goal. He certainly gave the people of Vancouver something to talk about. That is, "where the hell his Crosby?" PENALTIES: Though the Canucks only got 1 powerplay goal, the Pens gave them 6 tries which amounted to a lack of puck possession. SESAME STREET: Matt Cooke executed the way we anticipated and got the second goal of the night for the Pens. Staal and Kennedy assisted proving a solid night for our beloved 3rd line. Outside of Kennedy's injury earlier in the season this line has proved to be the most consistent all year. Geno's field goal was impressive. 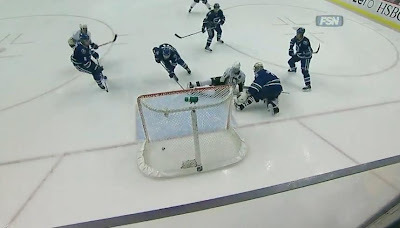 Though Luongo was insanely out of position. Pechurski doesn't speak a lick of English, but he could read the scoreboard no doubt. Signing a one day contract with the Pens this kid had no idea he was going to actually be taking the ice. But in doing so he showed some serious patience and looks to be a decent prospect in the future.